Lincoln Electric Inferno Machine auto darkening welding helmet. This second generation retail welding helmet has a larger viewing area (3.78 inch x 2.05 inch) and many improved practical features to make welding safer and easier. Get the most advanced and performance proven LCD technology with the Grunge auto darkening helmet. Better than another set of hands! A must have for novice and veteran welders, alike. Split second switching means that work proceeds safely and rapidly. Lincoln Electric Camo auto darkening welding helmet. Features a LCD viewing area of 3.78" x 2.05", with external variable shade control. A lightweight helmet that comes with upgraded optics and electronic features, comfortable headgear, an absorbent oversized sweatband, extra inside and outside impact resistant clear lenses, and is magnifying "cheater lens" capable. Lincoln Electric Midnite Black auto darkening welding helmet. Features a LCD viewing area of 3.78" x 2.05", with external variable shade control. A lightweight helmet that comes with upgraded optics and electronic features, comfortable headgear, an absorbent oversized sweatband, extra inside and outside impact resistant clear lenses, and is magnifying "cheater lens" capable. Lincoln Electric Bloodshot auto darkening welding helmet. Features a LCD viewing area of 3.82" x 1.73", with external variable shade control. A lightweight helmet that comes with comfortable headgear, an absorbent oversized sweatband, extra inside and outside impact resistant clear lenses, and is magnifying "cheater lens" capable. 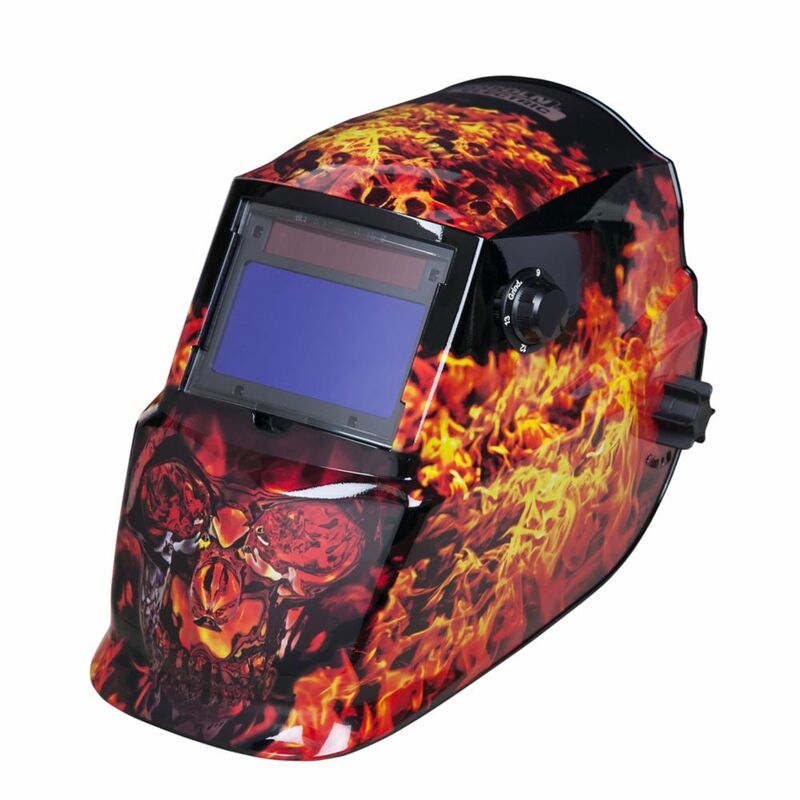 Lincoln Inferno Machine welding helmet Lincoln Electric Inferno Machine auto darkening welding helmet. This second generation retail welding helmet has a larger viewing area (3.78 inch x 2.05 inch) and many improved practical features to make welding safer and easier.